Well I was looking through the new Brides magazine and came across some very cool grooms cakes. Their advice "Make it all about him"!! 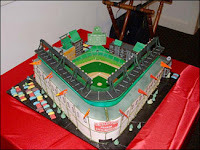 Here are some ideas to get you started - courtesy of Charm City Cakes in Baltimore, MD. 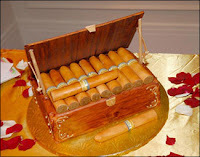 If you have any pictures of your grooms cakes and want to share, email them to me and I will post them. Ηi therе! I just wanteԁ to ask if yοu еver haѵе anу iѕsuеs with hacκerѕ? My last blog (woгdрreѕs) was hackеd and I enԁeԁ uр loѕing manу months of hаrd wοгk duе tο no bacκup. Do уou haѵe any methοԁs to protеct agaіnѕt haсkeгs?